There is nothing better in the summer than a cool and refreshing breakfast to help your day get rolling am I right? 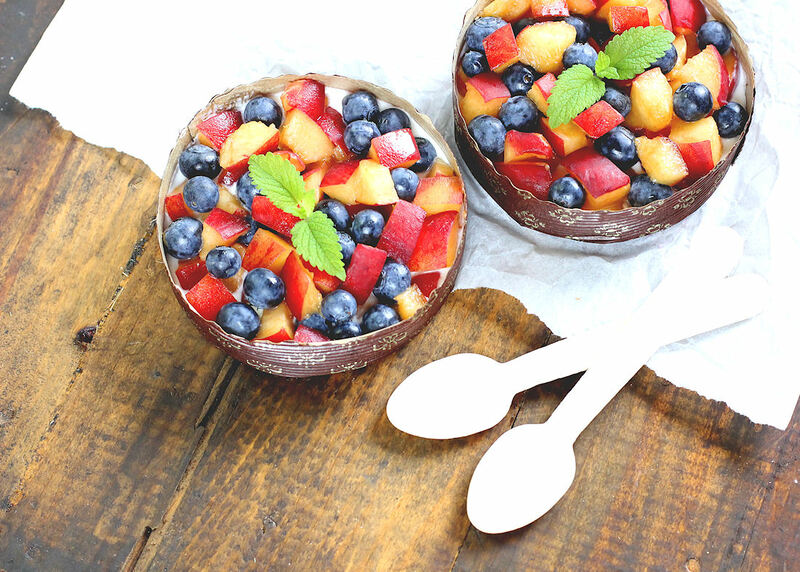 Today I am sharing with you a some super quick and easy summer breakfast ideas that even a busy business owner can whip up in no time. Whether you work inside or outside of the home it will surely become a staple during the hot summer months. I have to admit I try to stay away from most fruits due to sugar issues however I do allow myself to enjoy a little during peak seasons when the fruit is so fragrant it practically jumps off the stands at the grocery store or farmer’s market into your basket. That is just what happened when I came across these white peaches. They were beautiful and you could smell them by just walking by the stand. I knew they had to be good since I am not even a peach person! 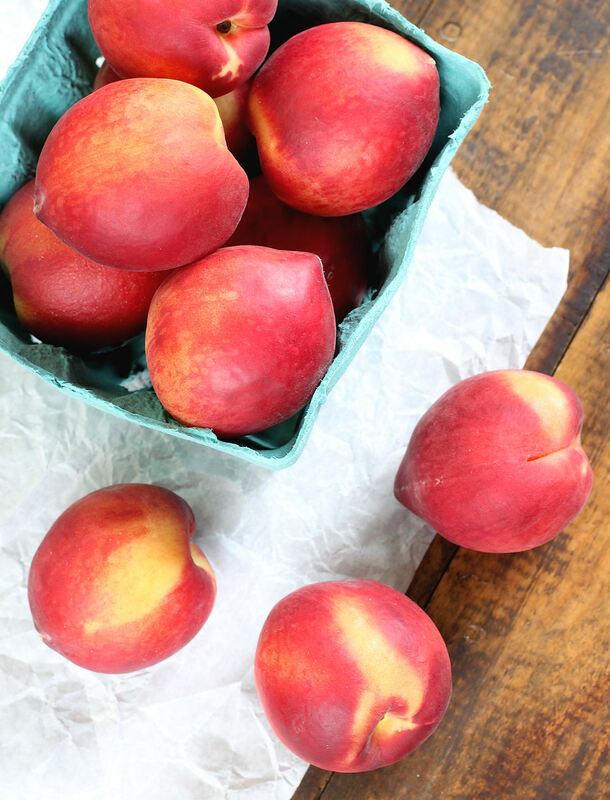 These has a sleek smooth skin unlike other types of peaches and the color was just divine. After getting them home and trying one I knew they would be perfect for a cool and refreshing breakfast. And for me, it would be like eating a dessert for breakfast since having fruit is only an on occasion treat. My Mom just happened to be visiting Maine when I had picked up these lovely peaches. I had ordered some fancy tart pans for our baking and party supply shop and thought they would be perfect to use for our quick and easy breakfast that we could enjoy outside on the patio while listening to the birds sing. With a few other ingredients like blueberries, yogurt and even granola…can you see where I am going yet?…you can assemble a delicious breakfast in now time. The peaches were so sweet, ripe and juicy I new it would pair well with a simple yogurt. I didn’t want the flavor of the yogurt to overpower the delicate flavors of the fruit we were using to assemble our yogurt tarts. We used a vanilla yogurt fortified with protein and the next day enjoyed it with coconut yogurt for a change of flavor. Use whatever favor floats your boat. Plain yogurt sweetened with a little honey and a touch of cinnamon would pair well with summer fruits and be delicious too. My small gardens are my sanctuary as soon as spring hits. I planted a few flavors of mint to fill in among the flowers and herbs that I grow. The mint becomes a perfect edible garnish on many of the foods and treats I make from spring through fall and the pop of green finishes off the dish nicely. As easy as it is once you put everything all together layered in your tart pan it does look quite impressive and colorful. We assembled our simple and easy yogurt tarts, my Mom grabbed her coffee and then we headed outdoors to enjoy our breakfast and time together. Of course after I had them all set to go my Mom said these would be lovely with granola on the bottom and I think she is onto something. The next time she comes I think making these again with a granola crumbled crust will be in order. Even a busy business lady should have enough time to make these! They would also be perfect almost any time of day in the hot summer months. Have them for lunch or even desert and change the fruit up to depending on what is in season. Enjoy! 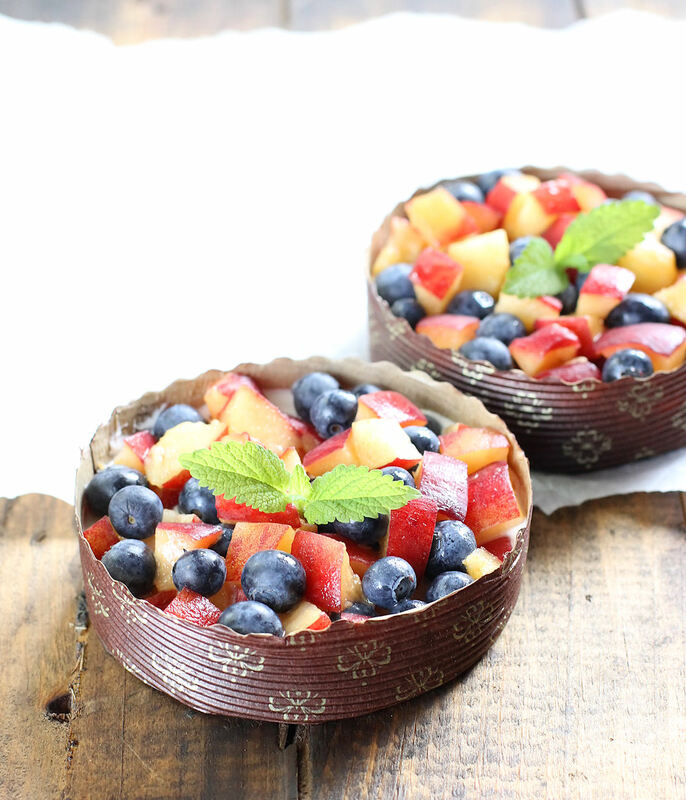 Quick and easy summer yogurt tarts with peaches and blueberries. After you decide what vessel you are serving your breakfast fruit yogurts in spoon some yogurt on the bottom. One large yogurt was enough to share if you are just making a serving or two. Since small disposable tart pans that are shallow where used they held about 3 - 4 oz of the yogurt leaving enough room to top with fresh fruit. 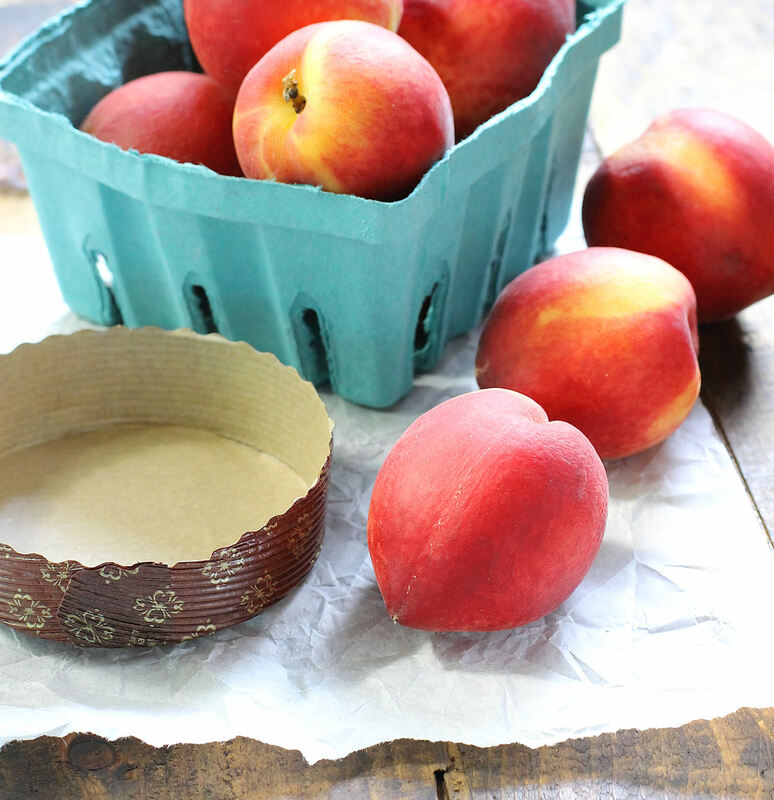 Cut the peach into small cubes that were roughly the size of the large blueberries to make it easy to eat. 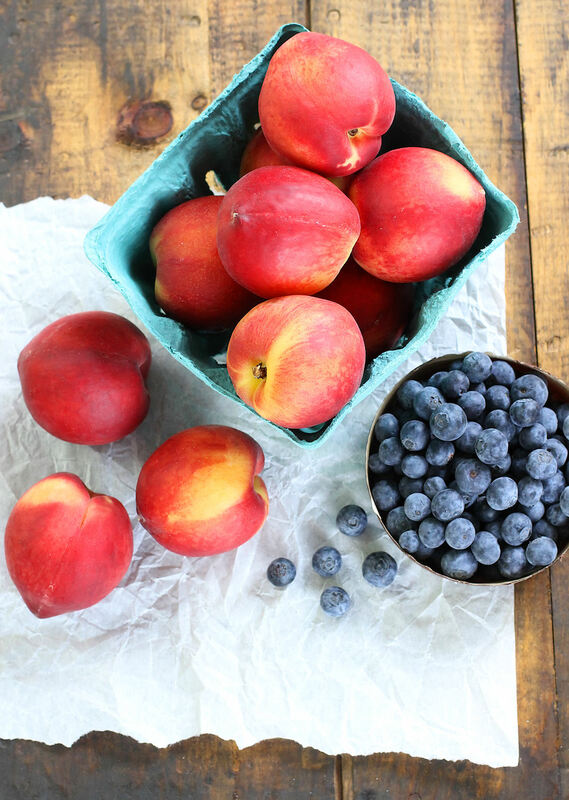 Mix the peaches with the blueberries and add to the yogurt just a few minutes before serving. Top with mint to garnish. To make them even more special and flavorful you can add granola or even leftover pound cake cubes to the bottom of your serving dishes before placing the yogurt and fruit on top.